George Herrera on his life-long fight for economic parity and the issues he sees as president and CEO of Herrera-Cristina Group, Ltd.
Few people are more qualified to speak on the state of Hispanic and minority-owned businesses than George Herrera. Today, Herrera operates the Herrera-Cristina Group, Ltd. (HCG, Ltd.), an organization that helps catapult minority businesses to new heights. 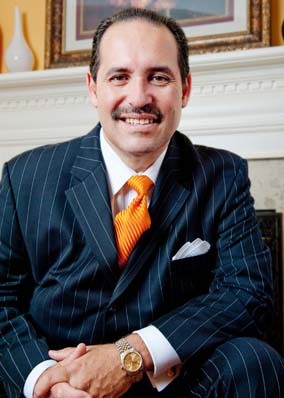 He is a past president and CEO of the United States Hispanic Chamber of Commerce (USHCC), current board member of Wyndham Worldwide Corporation, and creator of the nationally syndicated TV show Hispanics Today. How did you get started down the path of advocacy and public policy? I actually wanted to be a sportscaster, but my sister had started a management and financial-consulting company in her house and asked me to help her get it off the ground in 1976. We had the chance to go after federal contacts, which led to quick growth, and in four years we had 120 employees. That work led me to create a national platform of political and business leaders that would later serve as a springboard for my advocacy efforts. And you started to see the importance of minority business development? I was already aware of the need, as our voice and opportunity were growing. I was interacting with and helping young entrepreneurs. This started the process of us identifying procurement opportunities within Fortune 500 companies. We got very involved in advocacy for minority businesses and started interacting even more with major corporations and Hispanic leaders throughout the country. What led to your running the United States Hispanic Chamber of Commerce? I think it was a good fit at the time. The Chamber was going through some major transitions and I saw that I had the experience and the connections to get the organization where it wanted to be. I had prominence and understood minority business. I could run a nonprofit as a for-profit endeavor. It also allowed me to have a platform to serve as a national spokesman for the Hispanic business community. Having a bully pulpit such as the USHCC opened many doors to CEOs of Fortune 1000 companies. For too long we let corporate America dictate our relationships while we drive major dollars to them. We let them decide how they are going to interact with us. My mantra was: “If we’re good enough to purchase your products and services, we should be good enough to sit in your board rooms.” They kept claiming that they couldn’t find qualified Latinos, which is funny, because they are certainly able to find us when they are trying to sell their product. By really driving that message to corporate America, I think I was able to bring a new brand and approach to the chamber, and also start a national dialogue of diversity and inclusion. Tell me about your national TV show. In 1998, I was watching CNN, and a segment came on about the Hispanic community in America. It was the typical, negative story of our community being one comprised of crime, school dropouts, illegal migration, et cetera. And as usual, it was a story told by an Anglo reporter, who you could see had done little research. I decided to set out to try and convince a TV network to allow me to develop a show concept that would capture the positive contributions that Hispanics where making in all segments of the American fabric. NBC TV in New York agreed that the time was right to showcase Hispanics in a positive light, and I created Hispanics Today. It started as a monthly TV show the first year, and due to its rating success, was moved to a weekly show a year later and aired after Meet the Press. Years later, you’re still focused on minority business development. Why? It’s the fastest-growing sector of the small-business community, growing at a rate three times faster than the overall small-business community. We had a vision in the ’80s and ’90s to move the dialogue from civil rights to economic rights, but did not see anyone in our community taking the lead. Questions need to be asked and answered. Who is talking about being a voice for economic parity for minorities? We need to tell our youth to start thinking about becoming an employer instead of an employee. We need to bring entrepreneurial success stories to the community, which is part of what we were trying to do with the TV show. We profiled the Hispanic co-owner of the Colorado Rockies (Linda Alvarado) and the Latino who made Coke what it is today (Roberto Goizueta). Where do we stand with these issues today? There is still work to be done in unlocking the doors to the corporate boardroom in America. In 2013, we still have 832 companies within the Fortune 1000 that do not have a Hispanic board member. It seems a little incredulous, that this number is so high in the 21st century in America. Why is working with the HACR important to you? There is still work to do when it comes to Hispanics and Latinos being adequately represented in corporate America. We’re trying to establish a better dialogue with businesses and open up more opportunities through advocacy. The Hispanic Association on Corporate Responsibility (HACR) acts as a watchdog to assess companies and initiate this important dialogue. They have established a report card on diversity and other issues and are looking to advance Hispanic interests in American businesses at an appropriate level.